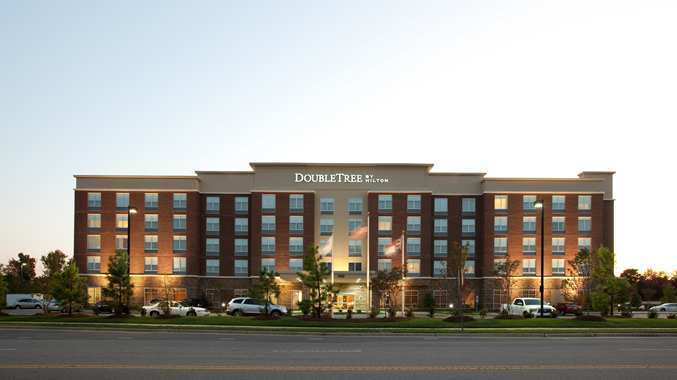 DoubleTree by Hilton Raleigh-Cary Hotel is conveniently located in Cary, adjacent to the Crossroads Shopping Plaza between Raleigh and Research Triangle Park—just a short walk to over 70 stores, restaurants and the Regal Crossroads Stadium 20 and IMAX theaters. Located near several businesses and attractions this Cary hotel is close to downtown Raleigh, RDU International Airport, Regency Park, North Carolina State University, WakeMed Cary Hospital, N.C. State Fairgrounds, PNC Arena, Carter-Finley Stadium, WakeMed Soccer Park, Koka Booth Amphitheatre, Triangle Aquatic Center, Walnut Creek Amphitheatre, Cary Tennis Center and much more. This property is a contemporary hotel featuring simple, uncluttered design with honest, uncomplicated comfort. This Cary hotel offers smartly designed guest rooms, sleekly designed sunlit lobby with dual-sided fireplace, on-site full service Park Bar and Grill restaurant, room service, free high-speed Internet, free business center, indoor saline pool, large state-of-the-art fitness center, 24-hour grab-n-go pantry and much more. This is a 100% smoke free hotel.